The Best Toys for Your Picky 7-Year-Old Girl: She'll Love These! Is it that time again when you want to buy something nice for your daughter, niece, or granddaughter? Are you wondering what kind of toy to get her now that she’s growing up? I know that feeling all too well, and I also know some tips and recommendations that’ll go a long way. At 7 years old, your baby girl is a curious little human who is just starting to discover her individuality. At this age, girls are creative, practical, fun, and even dramatic. Their tastes seem to keep changing, and so does their outlook. From toys that enhance and nurture cognitive abilities to those that inspire ingenuity and creativity, there’s a lot to choose from. Don’t worry — you’re about to learn how to hunt down the best toys for a 7-year-old girl. Use the links above to check the latest prices or read our in-depth toy for 7 year old girl reviews below. Ensure you get your daughter something she will not only learn from but love as well. Development milestones play a huge role here. At 7 years old, she’s already mastered her motor skills and has control over her hand-eye coordination (source). Physical development: Your little lady is likely to be more competitive and more confident with herself. She’s also likely to have a preference when it comes to learning styles. She might like to work independently, or she may thrive in a group with her peers. Cognitive development: You might have noticed that at this age, she has a longer attention span. Your 7-year-old thinks logically and expresses herself quite well. She’s also likely to be very curious, so you need toys that enhance her problem-solving and memory skills (source). Social development: At this age, most girls like to socialize and play with their peers. If your little girl does, you might want to consider dress-up toys. She’ll get to improve her social skills as she interacts with her peers during games. Your little girl seems to be maturing quickly, and you might be confused about what will really interest her. Let’s look at some of the factors you need to consider if you’re going to hit the nail on the head with this one. 1. Is the Toy Appropriate for Her Age? Most children at this age get bored very quickly. If you get something meant for a younger age group, she’ll likely lose interest very fast. If you get toys meant for older children, you might be courting extra risks and hazards (source). As your girl is maturing, she’ll have a longer attention span for more complex games and enjoy using her brain to solve problems. Kids have different interests and you might have observed her and realized she loves superheroes. She may love speeding cars, arts and crafts, or dressing up and having tea parties. Get her something she will enjoy playing with. 3. Is the Toy Girly or Gender Neutral? You might be tempted to buy girly toys, but thinking out of the box will truly pay off. By the time some girls are 7 years old, they’re no longer interested in playing with dolls or fashion accessories. Science projects, on the other hand, might keep them busy for hours on end. Allow your daughter to play with toys that interest her. Gender neutral toys are a good option. Your daughter will learn from an early age that she can achieve whatever she wants (source). 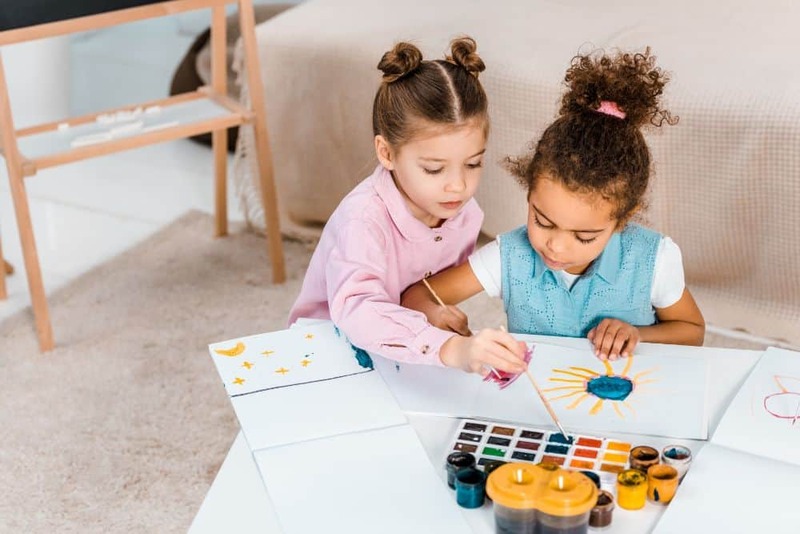 Now you know what to look for in the best toys for 7-year-old girls, I’m sure you’ll find something suitable for her from my list. Here goes. Children rarely lose interest when it comes to coloring. 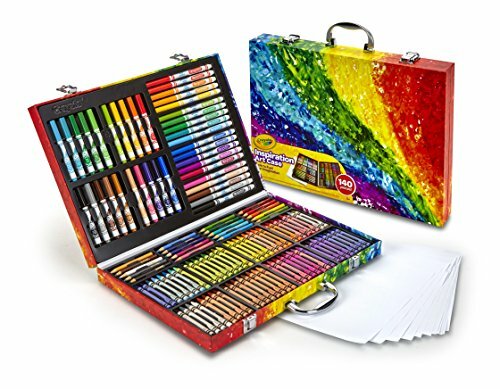 Any girl will have all the tools she needs for her artistic inspiration with this Crayola classic art case. It comes with 60 crayons, 40 washable markers, 20 short colored pencils, and 15 sheets of paper. A wide array of vibrant colors will help your child express herself through art. One of the things she’ll love about it is the carrying case that keeps everything in one place. You’ll also appreciate how safe and non-toxic the art supplies are. With multiple mediums to create, she’s going to unleash her creativity and have tons of fun while doing it. If your girl already has crayons, she might prefer something different. This window art collection features 20 whimsical art illustrations and 12 suncatcher shapes. She’ll paint and design to her heart’s content, then watch as the colors illuminate from the sunshine. This set promotes creativity as your daughter will get to mix paints. She’ll have an opportunity to come up with unique patterns and designs that showcase her personality. Included in the set is a design booklet that she can trace illustrations from. 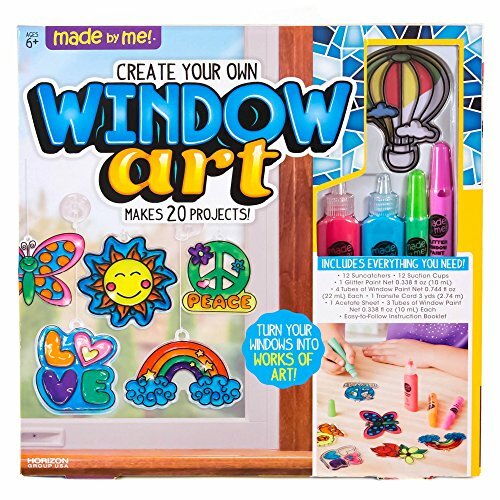 It also features suction cups that easily attach to glass, eight vibrant colored paints, and an acetate sheet for personalized creations. This creative kit is great for group activities or rainy-day crafts. Packed with 705 classic parts and pieces, this building set looks awesome. The rods and connectors attach to each other in different ways. This will allow your child to create different figures, shapes, and models. 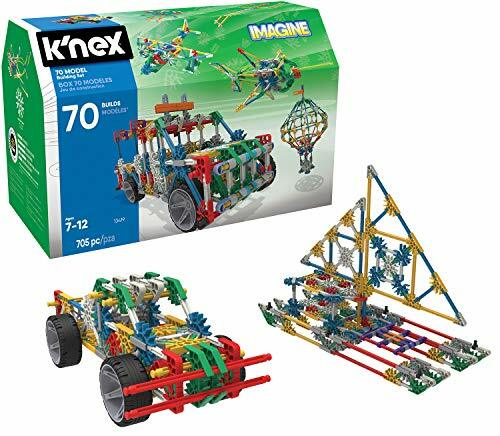 The kit features a booklet that showcases step-by-step instructions for 70 different design models, encouraging a better understanding of STEM subjects. It will strengthen her hand-eye coordination, problem-solving skills, spatial awareness, and motor skills. The kit comes with convenient storage and a parts guarantee from the manufacturer. My list would certainly be incomplete without this stomp rocket. My kids went crazy for this, and to be honest, I like it just as much. 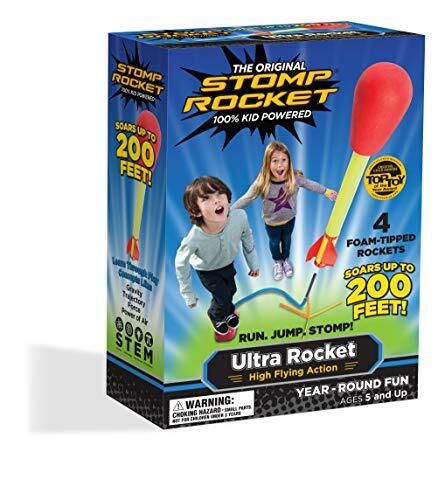 This is a great toy for outdoor play, as your girl will need to run, jump, and stomp on it to launch the rockets. It comes packed with one stomp launcher and four foam-tipped rockets that go as high as 200 feet. The foam tips make them safe to play with. The toy is not only easy to use, but she’ll get lots of exercise, retrieving the rockets after launching them. The shark is hungry and there are tasty fish in the water. Imagine the excitement of speeding up to catch them? 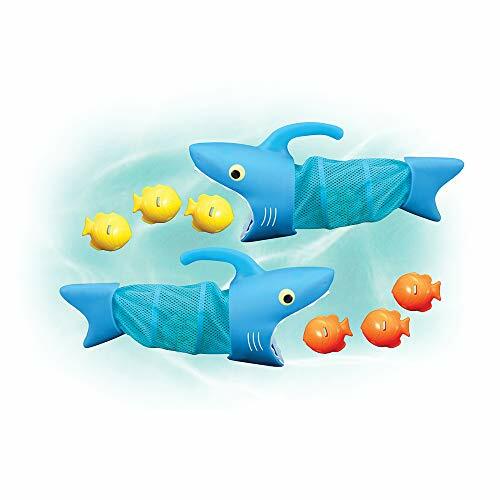 The shark net comes with a handle for easy grip, and when your child holds on to it, she can chase the fish sinkers. The game is designed to improve motor and water skills while keeping your girl engaged with inspiring imaginative play. The game is lightweight and easy to pack — you’ll love how portable it is. Even better, it’s an interactive toy set so she can play with her friends or siblings, which will further enhance her social skills. Naida needs to save Cory and baby Calypso, and she sure needs your girl to do it! This is an interactive Lego toy in beautiful colors. It involves building a magical water turtle with space for a tiny doll. 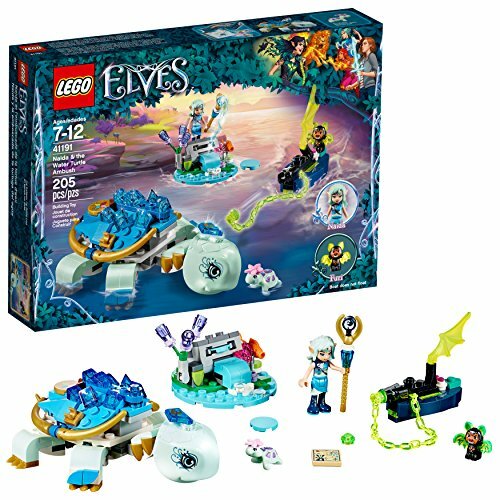 She’ll also get to build a boat with an evil chain shooter that comes with a space for a bat, a floating island with a disc shooter, and a space for a fish. The 205-piece set includes Naida, Cory, Furi the bat, and Calypso the baby turtle. Featuring five durable suction cup arrows, archery has never been this exciting. The set comes with an automatic illuminating bow that features awesome lighting effects. They’ll light up each time your daughter pulls the string, leaving a smile on her face. The sighting device makes it easy for her to aim for the target. 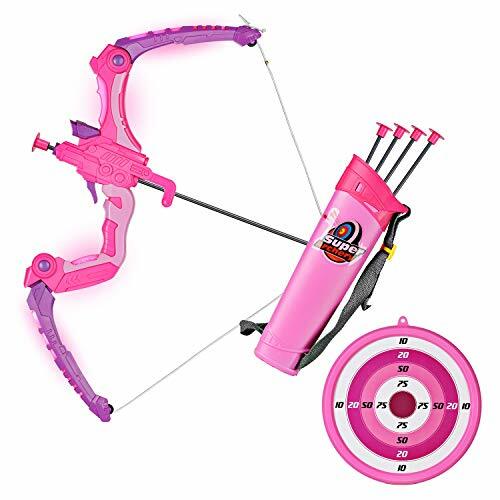 Archery improves hand-eye coordination, and you can minimize their screen time by offering them an interactive sports toy. It will also motivate their athletic talent. This is a good way to develop your daughter’s outgoing personality and competitive nature. 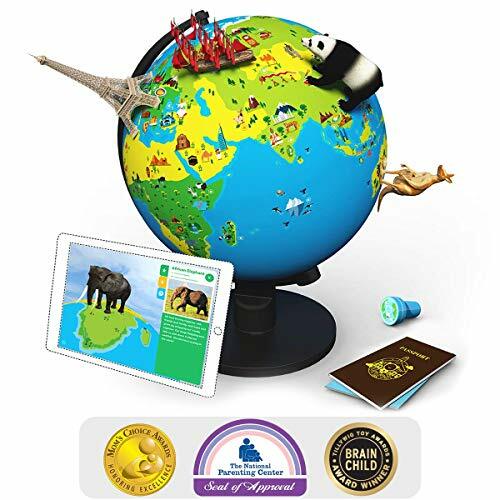 This intriguing STEM educational toy will help your daughter understand the world. It’s an app-based toy that’s compatible with Android and iOS devices. This globe will take your 7-year-old on an incredible, reality-based journey that she’s bound to enjoy. The box comes with a 10-inch globe, a stamp, passport, country flag stickers, and a very detailed help guide. App categories include monuments, cultures, animals, maps, inventions, and weathers for different countries. 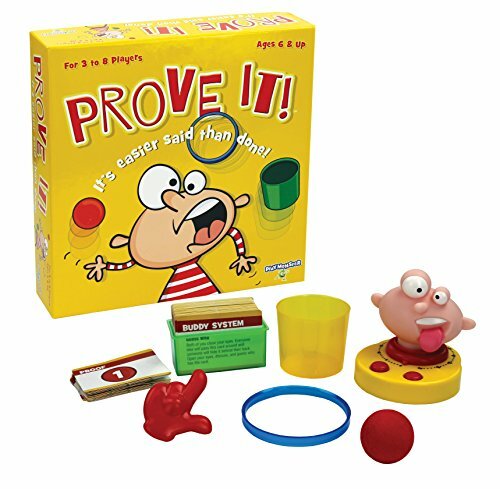 This is a toy for curious kids as it will spark their imagination and help with cognitive skills, linguistics, and knowledge. 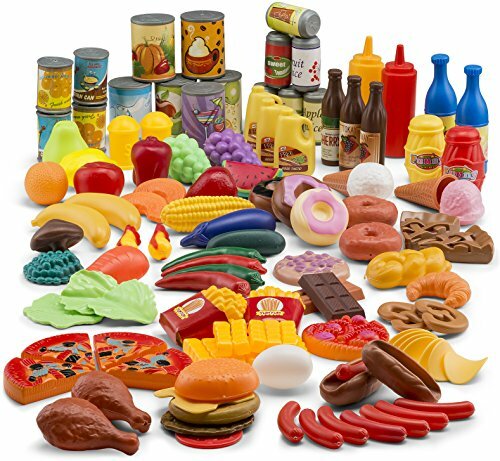 This toy incorporates 122 pieces of food, from fruits to vegetables and everything else in between. Your 7-year-old will feel like she owns a food store. Her cooking pretend play time will rise to a whole new level. She’ll be making breakfast, lunch, and dinner, and having snacks in between. How awesome is that? Your child will also enhance her imagination by making creative dishes. The toys come in bold colors and realistic designs for the ultimate kitchen experience. 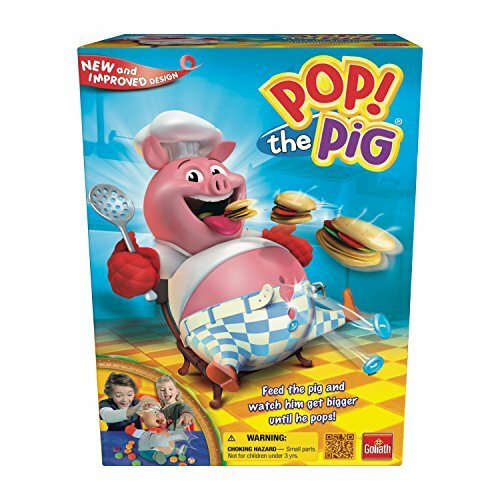 Pop the pig is not only interactive (given that it needs more than one player) it’s also absolutely hilarious. Kids get to feed the pig and watch its belly burst from all the food! Even you might not be able to hold in the laughter, watching them play. Your 7-year-old can play with siblings or friends and it’ll improve her social skills. She’ll learn to be patient by waiting for her turn. She’ll also learn how to operate in a group setting, how to share, and how to interact — plus have tons of fun too. If you’re looking for a toy that you can play with your little girl, this might be a good choice. Spending quality time with family is important, and it pays off to make it memorable. Prove It game will do that for you. You need to be the one who can do something better and faster than the rest — it’s all about brains, brawn, and teamwork. A dash of luck will also help the winner. For 3 to 8 players. 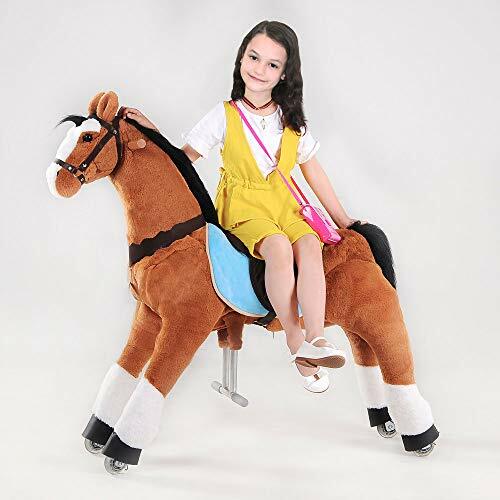 Horses are beautiful creatures and if your young lady thinks so too, this toy might be suitable for her. It bounces up and down to gallop and feels just like riding a real horse. You might also like that it doesn’t need power or batteries to run. It comes with soft wheels that will be easy on your floor. It also features three stirrups for different ages, which is great if you have other kids, or even if you want to try it yourself. Drones have become so popular that almost everybody wants one. Who wouldn’t, when they’re so much fun to play with? This Scoot hands-free drone might be the perfect introduction for a little girl. 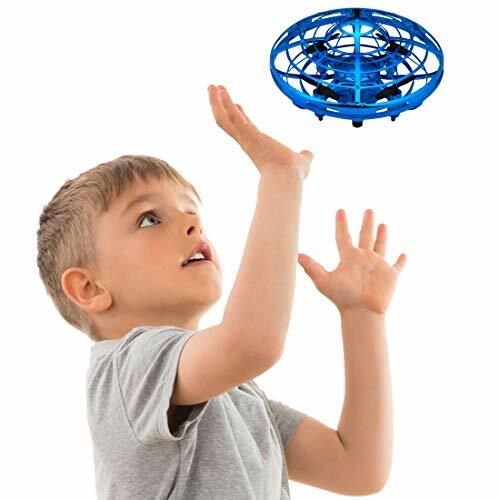 It’s a futuristic hover drone that doesn’t need a remote. It’s gravity-defying and can be played with both indoors and outdoors. It features a durable shell for protection, a sensor for guidance, and LED lights that add to the fun. Unicorns are such beautiful, mythical creatures that most girls are enchanted by them. 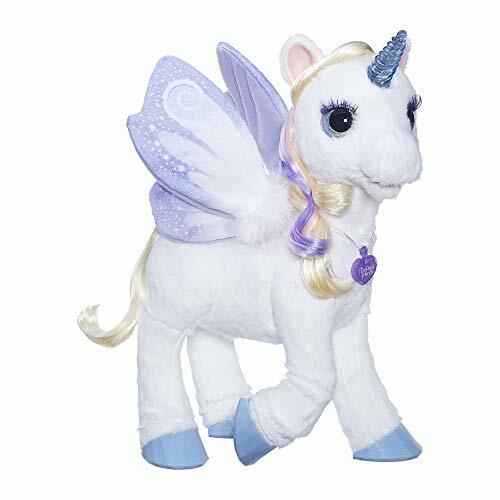 This magical, plush unicorn is designed with over 100 sound and motion combinations, making it responsive to voice and touch. It’s poseable, musical, and stylish, and your 7-year-old is likely to adore it. She can hug, pet, and enjoy how the unicorn flutters its beautiful wings. The horn lights up and flashes with different colors. Batteries not included. 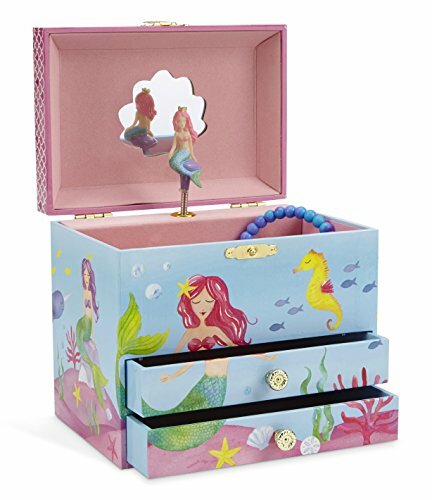 If your 7-year-old loves the mesmerizing world of mermaids, she might fall for this mermaid jewelry box. It comes fully assembled and is the perfect storage space for her tiny jewelry and treasures. It plays the “Over the Waves” tune and the pretty mermaid rotates to it. It’s lined with a soft velvet inside to keep everything safe and features a star-shaped mirror and two drawers. Many other styles are available, including ballerinas, hearts or unicorns. If your 7-year-old is a little explorer, this adventure kit will come in handy. 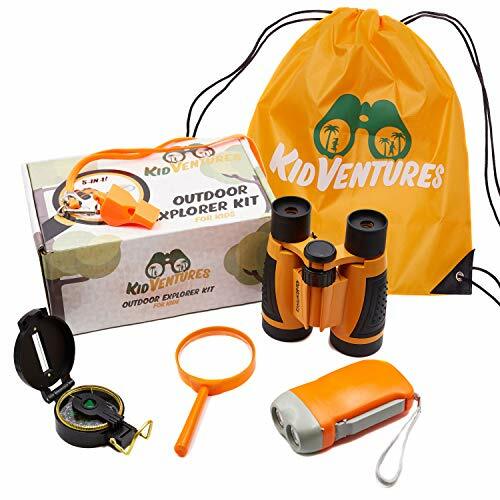 It’s a 5-in-1 set that contains binoculars, a magnifying glass, a hand-crank flashlight, a compass, a whistle, and a backpack. Family camping trips or hikes will be even more fun for her. The kit is lightweight, meaning she can take it wherever the adventure is. She will learn valuable nature skills, such as safety, navigation, and observation. There’s just something about superheroes kids cannot get enough of. I can’t count the number of superhero toys that are in my home. Katana is an amazing superhero and will inspire your baby girl to unleash her inner hero. 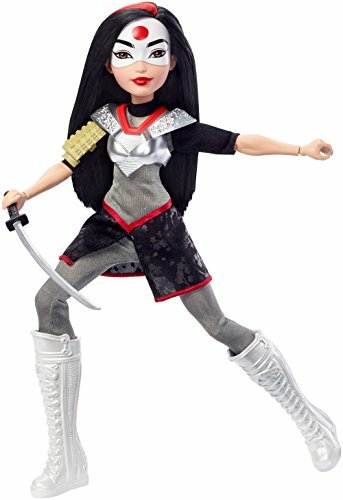 Katana comes with her iconic accessories, including tall boots and her silvery body armor. Her sword is also included, and she wields it with much power. With a martial arts expert, your girl can have fun saving the day. My personal favorite toy on the list is the Classic Inspiration art case. My kids absolutely love coloring, as most kids do, and I can almost guarantee that your special girl will be sold. The variety of colors is simply incredible, and the organizing case makes it easy to store and carry everything. The crayons and markers are all safe, durable, and non-toxic. If you already have that, there are plenty of others to choose from in our list of best toys for 7-year-old girls. Think about what your girl is most interested in and then pick an appropriate toy for her. Share with others to inspire them too!